If I seem obsessed with rehabbing horses, it's because I and everyone I know seem to have a horse in need of a little TLC. Minor injuries turn into major problems if they're not addressed and treated properly and promptly, but rehab is never fast nor prompt. It's the slowest part of the process, and it's important not to skip steps. 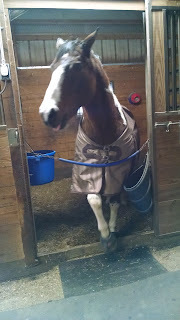 That pulled tendon might look normal again now that the swelling is gone and Footloose is moving normally in the pasture, but the strength in the surrounding muscles isn't back to full fettle until the whole horse has been worked slowly and patiently back into shape. Think about the last time you pulled a muscle or dinged up a shoulder joint in your own athletic little self. I, for one, can't forget as all of my old un-rehabbed injuries have come back to haunt my dotage. You have pain in some body part--your hip, for instance--so you can't fully use that hip joint appropriately and you adjust the way you move to compensate. My daughter shouting after me, "Waddle like the wind!" sticks in my memory, and that hip disaster sticks in my body more than 12 years past the injury date. So there you waddle, and maybe you manage to heave yourself into the saddle to ride. But you're not using all the muscles you should be. Some of them are just lying there, flaccid stupid rat-finks that they are, and they're getting weaker by the day. It takes a mere two weeks before a muscle completely loses tone, and less if you leave it completely immobile or weren't in top condition before the unplanned horizontal girth inspection. If you take the time and put in the painful effort, you can work those weak spots back into harness in a matter of another couple of weeks. If you wait until your pain is completely gone, that could be far longer. And you're only carrying your own body weight. Now look at the horse's tendon again and think about how it would feel if it were yours and you were carrying a fifty pound bag of feed on your shoulders. Yeah. The linked article gives a nice selection of groundwork exercises you can start with as your horse sits around unready to be ridden. There can never be too many stretches. You know that. So start with those. Even before you are doing more than hand-walking him, stretches can figure in. Since I'm a clicker-training fan, I love using that time for a little extra trick training. 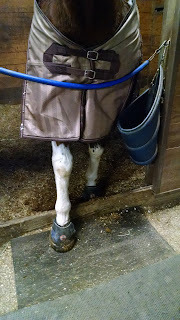 When Zip, for instance, is recovering from one of his many self-inflicted injuries to his front hoof or foreleg, the trick I cue with "Show me!" is a great stretch and a great way to judge how well his healing is progressing. This is Zip a couple of weeks ago. He'd had an abscess in that right front hoof that had been the very devil to resolve since it involved gravel that traveled up between the hoof wall and sole. Once the abscess was successfully opened and drained...twice...by my faithful horseshoer, the next step was the healing. Now, since he'd been gimping around and at one point had some infection traveling up his leg, he wasn't using any part of his body appropriately, but the full-body-work part of his rehab is still to come. At the moment he's on turnout just doing it himself, walking around and using all of the pieces as they were designed to be used. But the weak right front leg and sore hoof were more important from the get-go. 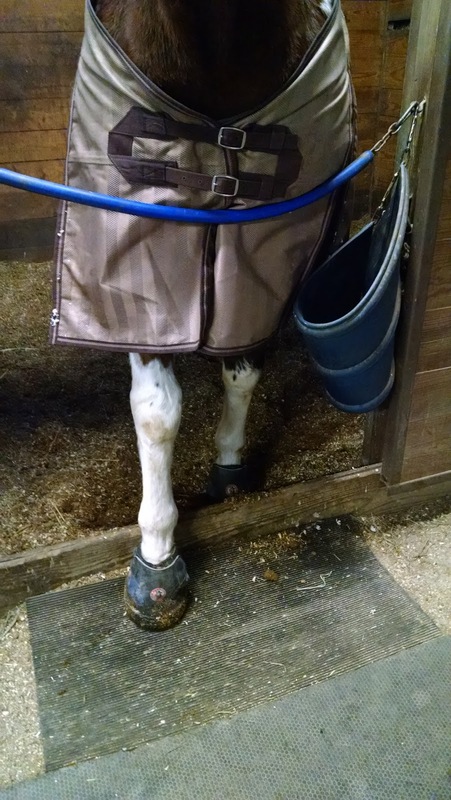 So the boots went on to protect the healing hoof (a nifty item I covered two weeks ago with links and everything) and to hold the poultice to keep him healing, and the first test was "Show Me". The pictures show him demonstrating with the right front--the damaged hoof--which is great. That he picked it up and put it out for me to check was a step in the right direction...literally. The better news was that he did equally well with the left front, meaning that he was more than willing to put full weight on the healing hoof. I trained this years ago by combining "Pick it up" (the hoof), "Hold it" (off the ground), and then manually pulling the foreleg forward and adding "Show me" as the cue. If you do all that in advance, then the next time you want to see how he's progressing, you needn't contort and poke and prod. Just ask, and he shall reveal! This is also the beginning of the "Big stretch!" behavior where I ask for both front feet to be extended in a full-body stretch. If he's feeling up to snuff, he'll perform it and it'll be good for both of us. If he's stiff or sore, I'll get a big NO on Big Stretch and I'll know there's work to be done. So there you have it. Start small and work up to that five minutes under saddle. You won't regret the time invested. Hands-On or Hands-Off? What's the Big Deal?